Is it just me or does everyone feel a little intimidated when in the presence of a knife? A real knife, not those cheap knock-offs that hardly slice a thing. I’m talking about a real, super sharp, masterpiece of a knife. Well, the intimidation cuts right through me. And it’s not in a bad way, no. This is the kind of intimidation that comes coupled with a bit of reverence. Reverence for the strength and power. And that’s exactly what I feel every time I look at The Ontario 499 Knife. Its demeanor tells you it wasn’t made for an easy life. It feels rugged in hand. You can tell, right away, that this knife is a diligent servant. I’m sure you’re curious. So, without further ado, here’s the Ontario 499 Survival Knife Review. A poor blade makes a poor knife, period. There’s no question, the most important part of a knife is the blade. To tell whether you have a good knife, the blade has got to be sharp, strong and durable. So, does the Ontario 499 Survival Knife qualify? It certainly does folks. The blade is made of carbon steel. On hearing this feature, the word that immediately comes to your mind is the strength. And true to nature, carbon steel is a strong metal meaning that this blade inherits that quality. You’ll scrape, chop, slice, cut but it still won’t flinch. That’s not all. The blade has a zinc phosphate coating to protect it against rust. So, yes, this blade will last you a very long time. Your palm is constantly wrapped around this part. As you work with the knife, you need to feel comfort. This handle is made of high-quality leather that gives the knife a powerful look yet is very comfortable to hold. And we all know that leather is long lasting, right? So, you know that this handle is endowed with the durability that comes from the leather material. The combination of the strong blade and hard wearing handle makes for a tough knife. Right, this being an EDC (everyday carry knife), size is very important. We want an EDC that’s portable. So, imagine my excitement when, on lifting this mass of carbon steel and pure leather, I felt the weight to be lighter than I thought. At only 9.9 ounces, be sure that you’ll be able to carry this cutter wherever you go easily. The length, also, isn’t that much but is just enough. The blade measures a length of 5 inches. So, when it comes to portability, the Ontario 499 Survival Knife qualifies. Now, yes, we’ve said it’s lightweight and highly portable, but how does one carry it around safely? Don’t worry people, the makers of this Ontario 499 survival knife thought that through. To ease portability, this knife comes with a handy leather sheath. So, if you need to travel with it, simply slide it into its sheath and tuck the package away nicely. The sheath is strong enough to keep the blade inside, protecting you from the accidental piercing. Moving right along the spine of the blade is a serrated edge known as saw teeth. Now, these saw teeth make the blade versatile. You could use the razor sharp flat edge or when the need presents itself, turn it and use the saw teeth edge. For instance, when out camping and you need to cut up some rope, turn to the convenient saw teeth spine of the Ontario 499 survival knife and get the work done. Strong carbon steel blade that can handle heavy work. The blade is also coated with zinc phosphate to protect it against rust. The natural leather handle is comfortable and long lasting. The saw teeth, on the blade, make it a versatile knife. The knife is lightweight and is, therefore, easy to carry around. It comes with a leather sheath for added portability. The Ontario 499 survival knife is easy to sharpen with a whetstone. The blade isn’t very sharp when purchased. It has to be sharpened before first use. This blade also dulls quickly and needs constant sharpening. The sheath has an aluminum guard to prevent the blade from piercing through it. Q: Is the material on the real handle leather? A: Yes, it is real leather. It’s very good quality. Q: Is there a whetstone provided for sharpening the blade? A: Absolutely. On purchase, you get a sharpening stone. Q: What is the overall shipping weight? A: The knife alone weighs just 9.9 ounces. The shipping weight adds up to 12 ounces. 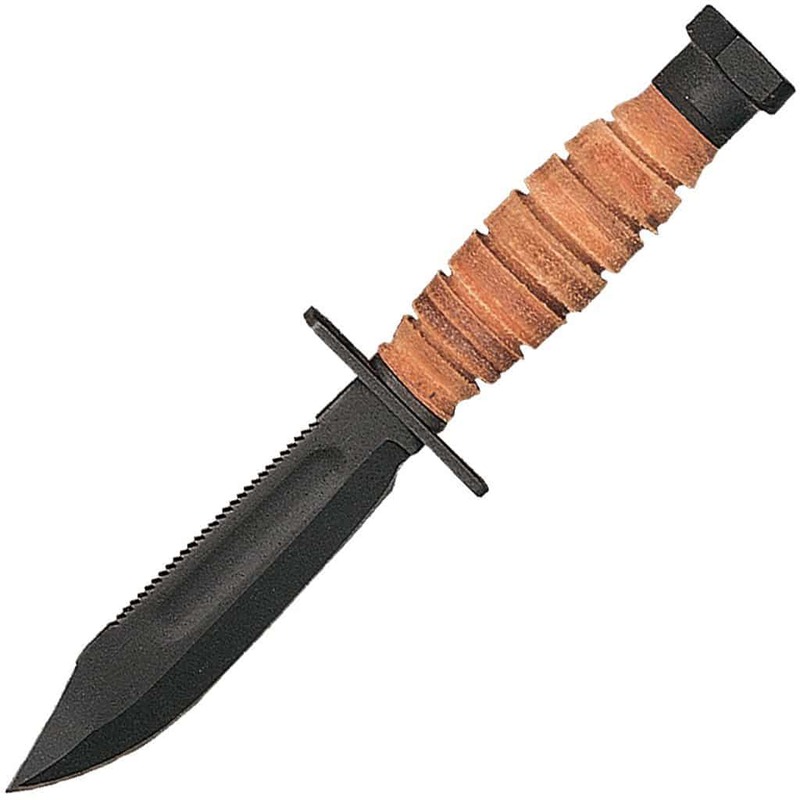 The Ontario 499 knife has been used by the air force and US army for years. That says a lot. And from this Ontario 499 Survival Knife Review, we see why it’s a preferred knife. It certainly is strong, no doubt about that. The blade has excellent durability qualities and the leather handle not only gives it a rugged look but also makes it suitable to hold. Yes, the blade tends to dull quickly, but it’s also very easy to sharpen. And when sharp, it effortlessly slices right through whatever you present it to. When done using it, tuck it into the sheath and be on your way. The Ontario 499 survival knife won’t let you down.